It's been years since Google has given its Android platform as fresh a face as this. The mobile platform's new look doesn't have a name yet (lollipop? ), but it's here to tie things together. What we're seeing today are mostly the design highlights from Android L. Android's Matias Duarte outlined his team's concept of material design, which will work to bring together tablets and phones, mostly by using cards, it seems like. It's pretty! It relies on an exposed navigation bar and material that can pop out and reform intelligently. App developers can specify an "elevation value," and has guidelines that lets the UI adapt to different screensizes, of where there are dozens and dozens for Android hardware. The UI also includes rich, animated touch feedback, to make for a more responsive experience and more seamless transitions. Here are a few looks at what that means in practice. If all of that sounds like jargon (basically if you're a non-dev), here's a walkthrough of what Gmail looks like now. It's got new typography that works as effectively on small screens (think smartwatch) and large (think giant tablet), with the same designs on every screen. Thanks to Polymer, which Google announced last year, it'll find its way easily to desktop applications as well. They'll all work at 60FPS on the web. The first of the new features Google wants to highlight is the one you'll care most about: UI. Expect more animations, more touch feedback. Your interactions don't exist in two dimensions, but three. Case in point, the phone dialer, which has ripple touch effects and material colors that really pop. We've obviously seen animations before, but in action here it actually looks zippy instead of slowing the device down. Your mileage is going to vary depending on your device, of course. It may spell trouble for aging handsets. Notifications are getting some tweaks as well; they've been streamlined so that you can have access to everything—and be able to interact with it—from the lockscreen. Double tap on a notification to launch the app, swipe to dismiss, and swipe away to access your device. It's definitely more visually appealing! There are also "heads up" notifications now, that appear on the top of the display (as in iOS) that you can swipe away. PINs and lockscreens pattern unlocks are almost never not dumb and annoying. Android L is adding something called "personal unlocking," which knows if you're wearing an Android (Wear)-powered watch and keeps your phone unlocked, because it knows you're there (or that someone stole your watch, too). It's not just look and feel that are getting an update; Chrome is getting a lot of love on mobile as well. It's getting a major redesign—including some of that material design fanciness—which means more cards! There are some nice touches; if you search for Starry Night, colors from the painting will be applied to the test bars you see. Open multitasking, and you get a card for each of your tabs. Which will be pretty panic-inducing if you—like me and maybe everyone—has way too many tabs open at any given time. There's also a new App Indexing UI (pay attention devs! ), the main takeaway for Android users being that if you're in Chrome and click an OpenTable link, you'll get sent straight to the restaurant page in the OpenTable app. But because everything is a card, it all feels seamless. Another benefit of apps communicating even better? If you're looking up the Ferry Building in Google Earth, the Google Search bar will remember, and show you the Google Earth result. That'll work for any apps that want to join in, not just Google products. Another more dev-facing development, but you should see the benefits as an end user. There's a new runtimem called ART, which was written from the ground up to support ARM, x86, and MIPS, and gives a 2x performance benefit without devs having to lift a little dev finger. It's also 64-bit compatible, more memory efficient, and has a pretty relatable name. Google's committed to catching up with Direct X 11, and is including Android expansion packs with things like shaders and tessilations. A look at Unreal Engine 4 running on some Nvidia hardware looked great, but when do graphics demos not! The claim is PC-level graphics performance in devices coming as soon as this fall, which would be great, but maybe worth unpacking that grain of salt you have handy. Project Volta has the best name-for-something we've seen so far, possibly this year? It's a way to make battery life more efficient. It provides lots of stats so devs can see what's sucking power and why, while the job scheduler API keeps apps limited when power's running low. There's also a new Battery Saver mode, which cuts off Wi-Fi and display power. Like airplane mode with superpowers. It reportedly will squeeze out an extra 90 minutes of battery time for you. 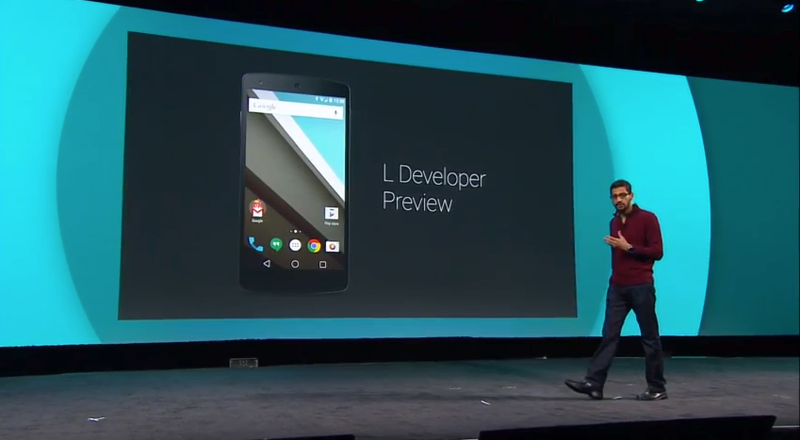 What Google also made clear is that L isn't just about your phone or tablet. It's about bringing together a broad range of products—including some that don't exist yet—whether they're watches or cars or home gear. So far they're short on details, which is understandable; a lot of the parts involved are still unknowns. But Google definitely has the pieces in place to make that happen; voice recognition, context awareness, and now a unified design that helps devices of not just different sizes but entirely different purposes communicate more easily. So far the L release is just a quick preview, so we can expect a whole lot more once it finally actually launches this fall (including a real name). But in the meantime, it looks like the biggest gains are going to be in that unified design, one that's flat and layered and animated, in ways that are definitely fun to look—and hopefully not a strain on your system. To keep up with the rest of our Google I/O keynote coverage, check out our liveblog here.